Comment out from AuthenticationScheme authnScheme = new AuthenticationScheme(rrq); and see if code is getting executed without any issue. Then if it is the issue then most probability its regarding host Identifier issue. Either add Preferred host from ObAccessClient.xml into ms_resource = "//HostIdentifierName/Welcome.html"
Add URL you are trying to use into Host Identifier in OAM Console. This issue mainly occurs because of Host Identifier problem, if you are not going through webgate then OAM can't identify which Policies it needs to apply. In that case it depends on Host Identifier. whats is resource uri used in creating "ResourceRequest" object ? java.lang.Exception: No Entry found for Primary server. SEVERE: Oracle Access SDK initialization failed. oracle.security.am.asdk.AccessException: OAMAGENT-02072: Failed to perform create access client operation. Update ObAccessClient.xml to have only one primary server. in Primary Server list. 1) You have the option to download user certification data to your local computer and work on it in an offline mode by using Microsoft Excel without having an active session with Oracle Identity Manager. 2) After making decisions on the certifications, you can connect to Oracle Identity Manager and upload your decisions. 1. In the left pane of Oracle Identity System Administration, under Certifications, click Certification Configuration. The Certification Configuration page is displayed. 2. The option to download user certification data to your local computer and work on it in an offline mode is available for user certifications only. Before you can install the Oracle ADF Desktop Integration add-in, Microsoft Office Excel 2007 or 2010 must have Microsoft .NET programmability support enabled. You can enable .NET programmability during the installation of Microsoft Office Excel 2007 or 2010. However, if you did not enable it at that time, follow the steps below. On your desktop click the Start button. In the Control Panel, double-click the Add or Remove Programs option. Once the list of installed programs is populated, scroll down to the Microsoft Office Standard 2007 (or 2010) entry and select it. You've successfully added .NET programmability support to Excel. You can install the ADF Desktop Integration add-in from JDeveloper, or from the setup tool provided in \jdeveloper\adfdi. This part of the tutorial guides you through installing the add-in from JDeveloper. Start JDeveloper by selecting Start > All Programs > Oracle Fusion Middleware 11.1.2.0.0 > JDeveloper Studio 11.1.2.0.0. If the Migrate User Settings dialog box opens, click NO. If prompted for a User Role, choose Studio Developer (All Features) and Close the Tip of the Day window. The JDeveloper IDE should now be displayed. Accept the licence agreement then The ADF Desktop Integration installer is started. Once Microsoft Office customization has been successfully installed, click Close to exit. You need to configure Microsoft Excel settings to make it accessible from ADF Desktop Integration. You only need to perform this procedure once for a given installation of Excel. On your desktop, click the Start button. In the Start menu, select All Programs > Microsoft Office > Microsoft Office Excel 2007 (or 2010). In the Office window, click Excel Options. The Certificate Manager tool (Certmgr.exe) is a command-line utility, whereas Certificates (Certmgr.msc) is a Microsoft Management Console (MMC) snap-in. in the MMC, select the Trusted Publisher and import the certificate. Now the Excel ready to show the data that is been downloaded from OIM dashboard. When the Enable Interactive Excel option is enabled, the Download to Editable Excel menu option is available in the Actions menu in the certification detail and certification summary pages of the user certification. Open a user certification from the Dashboard or Inbox. From the Actions menu, select Download to Editable Excel. A message box is displayed with the options to open or save the file. Make sure that Microsoft Office Excel is selected instead of Microsoft Office Excel (Default). Microsoft Office Excel (Default) is the version of Excel for which the plugin for this functionality is not enabled. Click OK. A message box is displayed asking whether you want to connect to the corresponding server where the application is running and from where the spreadsheet was downloaded. Click Yes. The page to login to Oracle Identity Self Service is displayed. This provides an extra layer of security before you can download the data to work on. Login to Oracle Identity Self Service by providing the credentials. The user certification data is downloaded into a spreadsheet. Select the decisions from the drop-down for each user. When a decision is selected, the Changed column displays a flag that indicates the change. The area highlighted in grey color is a read-only area and no changes can be made there. Decisions other than Certify cannot be updated unless certain conditions are met, and as a result, the data upload will fail. To view these errors, double-click the error field under the status column. Then, you can perform the necessary action to fix it before trying to upload again. Certify Conditionally: Comments and an end date are required. Once the decison been taken then Please click on Save to Server to load back the certifications. 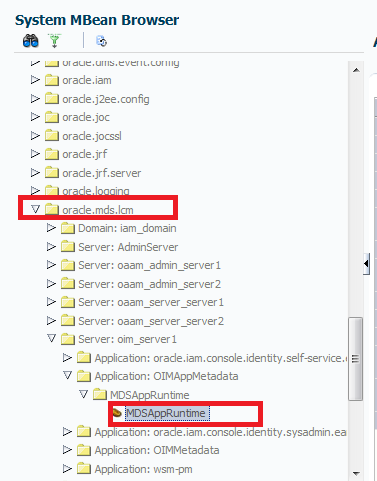 This post covers the user modifiable metadata XML files can be exported to MDS, imported from MDS, and deleted from MDS by using Oracle Enterprise Manager. Make sure that the Administrative Server and at least one Oracle Identity Manager Managed Server are running. 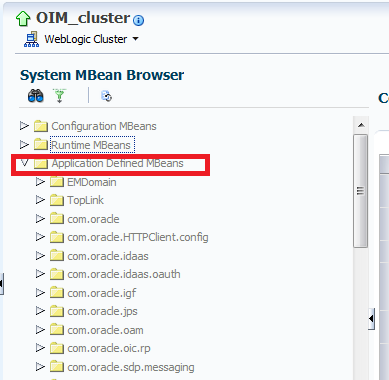 Under Application Defined MBeans, navigate to oracle.mds.lcm, Server:oim_server1, Application:OIMMetadata, MDSAppRuntime. Select and open the first exportMetadata operation in the list. For toLocation, provide the path to a temporary directory, in which this file is to be exported. This file will be exported to the computer on which Oracle Identity Manager is running. Therefore, make sure that the directory path you specify exist on that computer. For docs, click the pencil icon, click Add, and in the Element box, provide the full path of the file to be exported. By clicking Add, you can provide the path to multiple docs. Click OK at the bottom after adding the metadata docs to be exported. Login to Oracle Enterprise Manager as the admin user. Make sure that the Administrative Server and at least one Oracle Identity Manager Managed Server are running if the Domain is clustered. Navigate to Identity and Access, oim, oim(VERSION). Right-click and navigate to System MBean Browser. 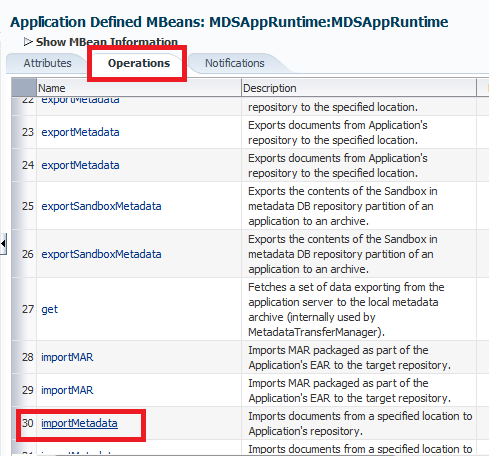 In the Operations tab, select the first importMetadata operation in the list. 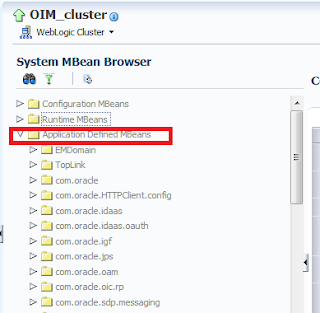 For fromLocation, provide the directory path of the Oracle Identity Manager host from where documents are to be imported. For docs, click the pencil icon, click Add, and in the Element box, provide the full path of the file to be imported. By clicking Add, you can provide the path to multiple docs. If no value is provided, then it imports everything under the fromLocation directory recursively. To delete metadata XML files from MDS. Navigate to MDSAppRuntime mbeans, as described in step 1 of Exporting Metadata Files to MDS. In the Operations tab, select the first deleteMetadata operation in the list. For docs, click the pencil icon, click Add, and in the Element box, provide the full path of the file to be deleted. By clicking Add, you can provide the path to multiple docs to be deleted. Login to Oracle Enterprise Manager as the administrator. 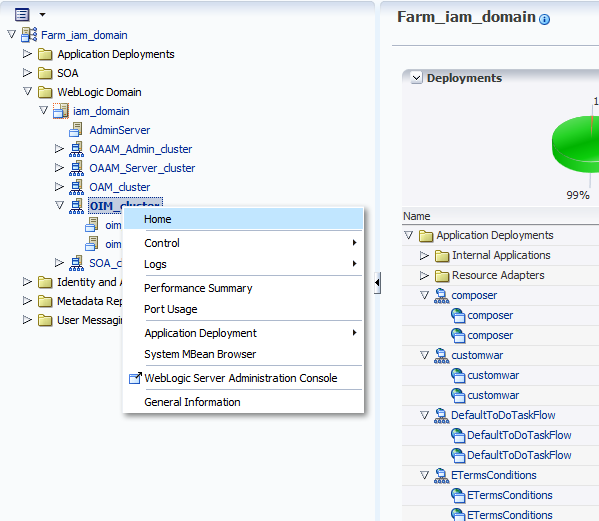 Navigate to Application Deployments, oracle.iam.console.identity.self-service.ear(V2.0). Right-click and navigate to MDS configuration. Under Export, select the Export metadata documents to an archive on the machine where this web browser is running option, and then click Export. All the metadata is exported in a ZIP file. Some configurations for Oracle Identity Manager are stored in an MDS repository rather than on a file system on the Oracle Identity Manager Server. Troubleshooting configuration issues can sometimes require exporting all MDS data in order to examine it and make corrections if required. To perform MDS operations, log in to the Oracle Identity Manager server host with the account used to install and run WebLogic Application Server. Create a temporary directory, such as /tmp/OIM/MDSData/, which will be used to store the resulting XML files from the database. Verify that the application server is up and running. Ensure that you know the WebLogic administrator username and the URL to the Admin Server. Perform the export, as follows:In the command shell or console window, go to the OIM_ORACLE_HOME/common/bin/ directory. 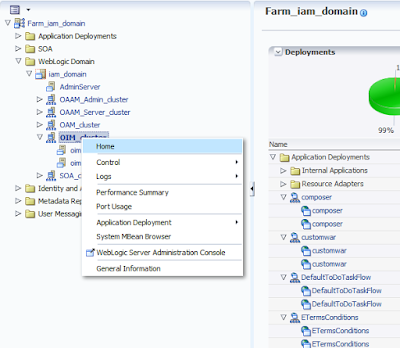 Successfully connected to Admin Server 'AdminServer' that belongs to domain 'OIMDomain'. Provide the WebLogic administrator username and password and the URL to the Admin Server.